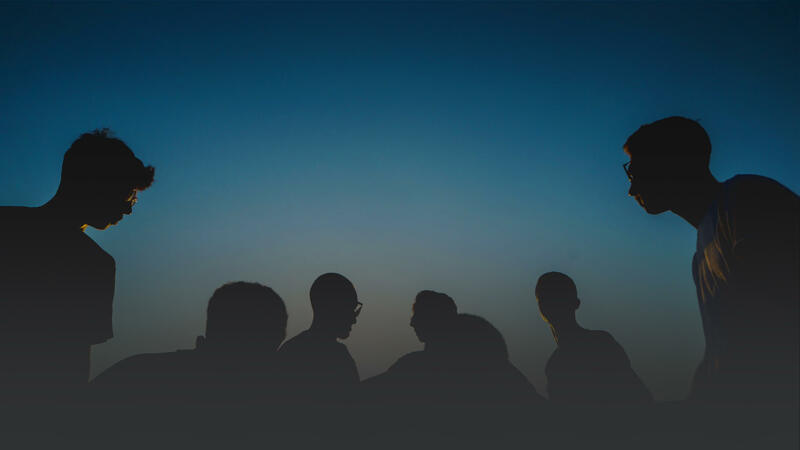 FENIX is a diverse team of professionals who care deeply about the work they do and the people with whom they work. Our org structure is intentionally flat. Team members are given every opportunity to increase their breadth. Simply put, everyone's work matters and has a direct impact on our clients. We cherish our work-life balance and genuinely enjoy working with one another. We hire talented individuals with personalities that support a great work environment. BASED ON THE TEACHINGS BY THE IDEAL TEAM PLAYER. Humility is not thinking less of yourself; it is thinking of yourself less. We do not support swollen egos, stubbornness, or selfishness. FENIX is a start-up and flourishes when its team is enthusiastic about the work we do. Your appetite for excellence is welcomed and encouraged. More than intellectually smart, we are also people smart. We pride ourselves in our vibrant, friendly community as well as our excellent delivery standard. Every member of FENIX is hand-selected for their expertise and how they’d fit into the team. 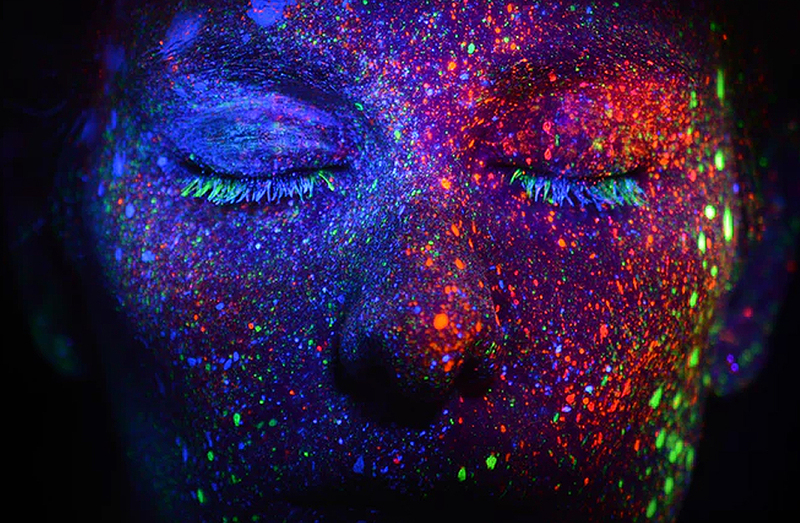 You vibe with others and contribute to the existing culture and team. You have a proven track record that results from solving challenges. You’re enthusiastic, passionate, and interesting. Good people skills and charisma are the exclamation point. While you participate and work well in our established culture, you also help shape it for the better. Grow and flourish without imposed ceilings with Fenix’s approachable management. FENIX praises leadership, tenacity, and communication. We are a nimble and growing company constantly being presented with new challenges. We value team members that jump right in, receive hands-on experience, and learn a ton in the process. 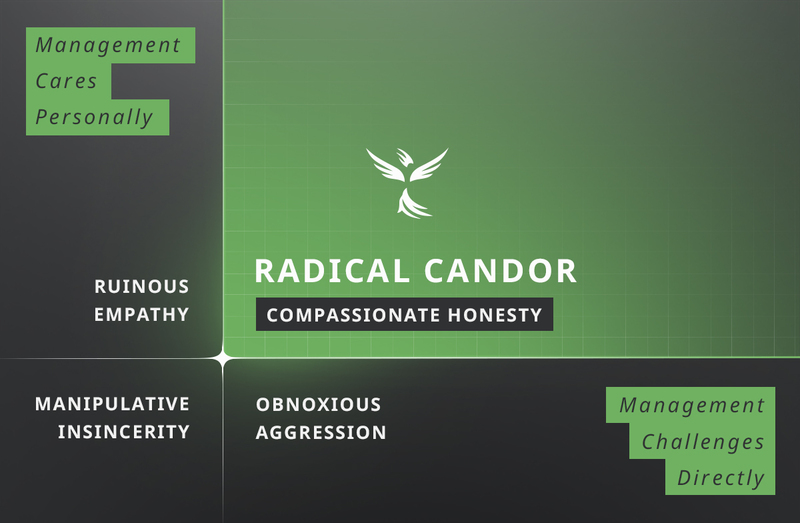 We believe in radical candor. More on that below. We will provide you with whatever you need to get the job done. We make sure that you are not only equipped physically with the tools you need, but also that you have the support and communication to confidently tackle a challenge. We pay well, but the rewards are more than just monetary. You will grow professionally and personally as part of the team. We also offer plenty of travel opportunities around the world. In-line with our mission statement, our purpose for existence and the underlying foundation for all that we do is to deliver Great. Client. Work. You will always know where you stand with FENIX. We believe in radical candor and use it as our guiding managerial philosophy. We will over-communicate and make sure that expectations are clear as it pertains to deliverables, and your growth as a member of the team. We don’t give “f#^db&*k” and we don’t just check in twice a year. We believe in-the-moment is the best approach. We believe the right balance comes between caring personally and challenging directly. This “in-the-moment” framework increases our organizational agility. OUR CULTURE AND THIS GRAPHIC INSPIRED BY THE RADICAL CANDOR MOVEMENT. Work in a global, diverse environment that is rewarding and exciting without the proverbial watercooler gossip. 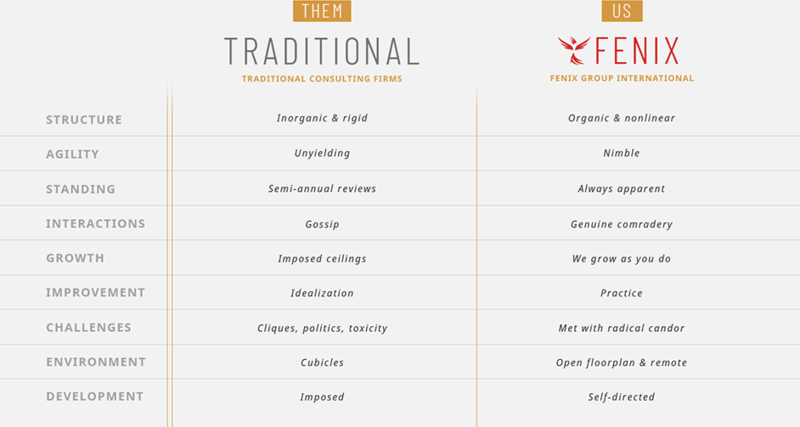 At FENIX, you’ll do real work that matters and has a direct impact on clients. There is no rigidity at FENIX. All of our team members have the opportunity to try their hand in a variety of functions. You’ll be able to step in on big projects and get a feel for different areas of the life sciences industry. Our goal is to put everyone in their own position to succeed, and we want to keep you hungry and enthusiastic about the work you do. FENIX is a growing, tight-knit group that spends a lot of time together in and outside the office. We believe our cumulative work is better when the chemistry is electric. If you sound like you’re a good fit for our team, we encourage you to submit your resume even if you don’t see a job opening fit for you. We are always looking to expand our team. Even if you don’t see an open position that matches your skill set, please reach out anyway. We will happily keep you in mind for future openings.